This is one of my favorite ways to do chicken, and it came from my resident GrillMaster, my husband, who does all our BBQing. The chicken is so moist and tasty, and if you have leftovers it is perfect to slice and add to a salad the next day! - Soak cedar planks in water for 1-2 hours. You soak them to help them not catch on fire in the BBQ, and as well to create some steam when grilling. If you soak them more than 2 hours the cedar flavoring lessens. 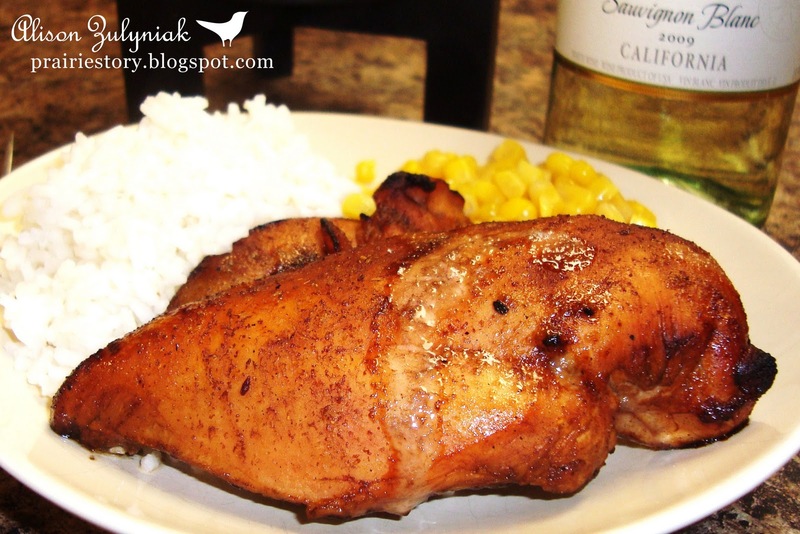 - Combine all ingredients to make marinade and pour over chicken. Cover and place in refrigerator for at least one hour. - Fire up BBQ. Brush your cedar plank with olive oil. This helps the chicken not to stick to the board. - Place chicken on cedar plank, and then plank in middle of BBQ on medium heat. Close lid and try to keep it closed for the entire 25-30 minutes of cooking. Of course, open the lid if you think the plank might be on fire! This sounds wonderful! I might adapt it for indoor cooking (we are getting into some very windy, rainy, cold weather here now) because the flavours combinations in this recipe are just fantastic. I like the idea of using leftovers for salad too - yum! Thank you so much for hosting - Happy Thursday! Yum! This sounds fantastic. I love anything with sesame. Looks so good and easy. Totally into recipes like this one right now. Oh boy this sounds delicious and grilling it would give it such a wonderful flavor that can't be beat. It looks perfect. Ginger and garlic are so made to go together. Tell the grillmeister that I'm impressed. You guys make a great team.